"There is really nothing more valuable in the historical and biographical ways than genealogy. Little grains of sand make the earth; little drops of water make the ocean, and little bits of Genealogy make the History of the World." Alexander Brown, 1886. We are dedicated to documenting the descendants of George Pegram of Williamsburg, Virginia from circa 1693 together with all related lines. If you have a Pegram connection, you have come to the right place. 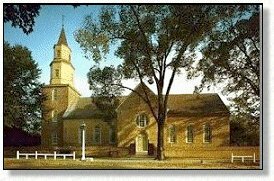 The picture is of the restored Bruton Parish Church in Williamsburg, Virginia where our early ancestors worshiped and many family members are buried. To see an 18th century painting of the church, pass your cursor over the photo. This site is the result of the collaborative effort of many of our cousins nationwide over last 11+ years we have been online. I would like to thank each and every one of you who have helped make this site possible. We currently have more than 40,000 in the database. As soon as the next update is online, we will be making CDs to share with everyone who has contributed anything to the database. Please don't be left out. We hope you enjoy your visit and will return often. Note: We are currently working diligently to update the existing Pegram files. The next upload will probably be the last time and it will then be too late to add additional information. Please, please, check your own lines and let me know of any errors, corrections, or additions. There are a few Pegrams born in the early 1900s that I have still not been able to place without ordering certified copies of individual records and it is really sad to not have them documented for future generations. The easiest thing for any of you to add is the name of your own grandparents for the spouses of those who married into the Pegram line. I don't know exactly when we will stop but it will be before the end of the year. Also, please consider adding all information for your family, even that which you do not want to appear online. I have decided to keep dual databases with one for the online update and the other to be kept private which will only appear when the CDs are released. This way, we can insure that future generations can find you, your family, including stories and photos, without violating your personal privacy.